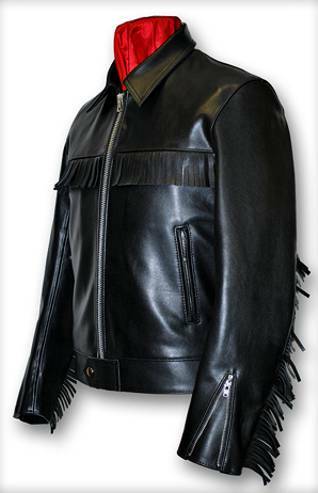 The Plainsman jacket was introduced by Lewis Leathers in the early 1960s. The design was no doubt influenced by the popularity of western style movies such as ‘The Magnificent Seven’ and TV show like ‘Gunslinger’ and ‘The Virginian’. Fringed jackets faded in popularity during mid 1960s but made a comeback again at the end of the decade with release of the 1969 movie ‘Easy Rider’. The Plainsman is original, exclusive and different; a super smart jacket in hand selected leather and with authentic western styling. It hugs your body and is lined right through with stout sailcloth and features hand-cut plainsman fringes across the front and back and down the arms. It has two handy zippered pockets and an inside wallet pocket. You’ll be the centre of attention in this unusual and eye-catching jacket.